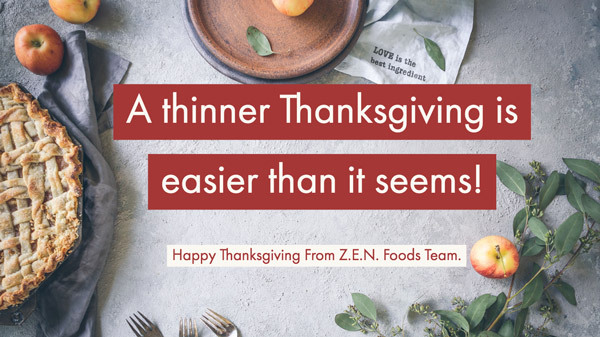 A thinner Thanksgiving is easier than it seems! Give Thanks to Feeling Your Best! Giving thanks sometimes means maintaining something we’re thankful for…like our health! But during the holidays, trying to keep up with our diets and exercises can make the Joneses look like turtles. Luckily, you have Z.E.N. Foods to help you stay Zen. Push yourself to exercise more than usual during the holiday season. Not only will enhancing your routine help counterbalance a questionable decision or two around the hors d’oeuvres table or booze cooler, it helps burn more calories at rest than you normally would have. “Bring Your Own Healthy Dishes” to give yourself and other guests nutritious, low-cal options. Pies that are sugar-free can be just as delicious, low-cal gravy and stuffing recipes are all over the internet, and casseroles…well, they might just need to be avoided. Even the healthier alternatives are questionable. When you eat a bit before the big feast, you might be hurting your appetite, but you’ll avoid completely ruining your diet. Then, you can more easily limit yourself to one helping come mealtime. Further, staying engaged in conversation forces us to eat slower, and organizing a backyard sport can help the whole family burn off some cals.